Dual Member Proportional (DMP) is a proportional electoral system that was created by Sean Graham in 2013 with funding from the University of Alberta. It was designed to meet Canada’s unique needs and broaden support for proportional representation. DMP appeared in Prince Edward Island’s 2016 plebiscite on democratic renewal, becoming the first Canadian invented proportional electoral system to be put to a public vote. It is now one of three proportional systems in British Columbia’s 2018 referendum on electoral reform. DMP works by replacing the existing single-member districts with about half as many dual-member districts. 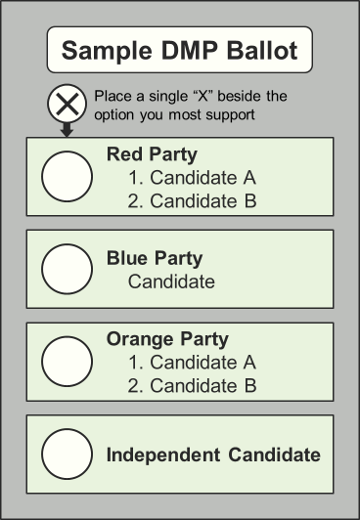 All candidates would run in their local district, and voters would choose their preferred candidate or pair of candidates using a straightforward single-vote ballot. The first seat in every district would go to the local candidate with the most votes, just like in the current system. The second seats would be filled to create a proportional election outcome by electing the top local candidates from each party until they have received their fair share of seats. This makes DMP a highly competitive system, as candidates are competing not only to have the most votes locally but to also have the highest vote share among the other candidates from their party. For an overview of how DMP works, check out the five-minute video found below. Thank you to the Ryerson University students who animated and produced this video. Accommodating rural communities by providing the full benefits of proportional representation without creating enormous districts. On May 30, 2018, the Attorney General of BC released the How We Vote report, which recommended that DMP appear in the 2018 referendum on electoral reform. This will be the second time DMP has been included in a public vote of this kind. The province-wide vote will be used to determine each party’s seat allotment. The geographically largest rural districts will remain as single-member districts. Votes cast in these districts will contribute to the province-wide total, ensuring that every vote counts. Independent candidates will be elected if they place first or second locally. A province-wide threshold will be set at 5%. These key recommendations ensure that DMP would produce highly proportional results at the provincial level, address the concerns of rural British Columbians around district size, and be fair to independent candidates. Sean Graham appeared on the July 12, 2018 edition of the PolitiCoast podcast to talk about DMP and the BC electoral reform referendum. This interview can be heard below. On September 29, 2016, Sean Graham appeared as a witness before the Special Committee on Electoral Reform to present DMP. His submission to the Committee can be viewed on the Government page or by clicking here. To hear his testimony, listen to the audio clip below. On November 7, 2016, the plebiscite on democratic renewal in PEI concluded. As a result of the recommendations made by the Special Committee on Democratic Renewal on April 15, 2016, DMP was one of the five options Islanders were able to choose from. The other four options were First-Past-The-Post (FPTP), First-Past-The-Post plus Leaders (FPTP+), Mixed Member Proportional (MMP), and Preferential Vote (PV). According to the Interim Report of the Chief Electoral Officer, DMP received a significant level of support in this plebiscite. In the initial round of counting, DMP received nearly three times as many votes as FPTP+ and more than twice as many votes as PV. By the third round, DMP had taken 41% of the vote for change. The majority of the votes cast for DMP were then redistributed to MMP, pushing it over the edge to win the plebiscite. However, it is important to note that 26% of DMP’s supporters chose not to endorse MMP. This demonstrates that DMP was able to bring a significant number of people on board with reform that MMP could not. Further evidence of DMP’s broad appeal can be found by looking at the distribution of the second choice preferences. DMP was the second choice of more voters than any other option. Moreover, DMP received more first and second choice votes than FPTP, suggesting that it has broader support than the current system. Sean Graham holds two Bachelor of Science degrees from the University of Alberta and can be contacted by email at smg1@ualberta.ca.